Where do funds raised at PNO go? How do I purchase PNO tickets? How can I help with PNO? Do we sell ads in the event program? PNO stands for Paumanok Night Out. It is our biggest fundraiser of the year. PNO is a great way to spend a night out and meet other families from your class. The night includes dinner, DJ, amazing raffles and more. Dress is casual. The funds raised at this event go directly to the Arts in Education programs that our children enjoy. Just to name a few examples, there is Movie Night, Fall Festival, Field Day and the many assemblies throughout the year. PNO tickets are $60 each. If you purchase your tickets during our presale prior to winter break, you will recieve 7 free raffle tickets the night of the event. Tickets can be purchased at any PTA meeting with check, cash or credit card. Presale flyers will come home with your child in September and invitations in January. 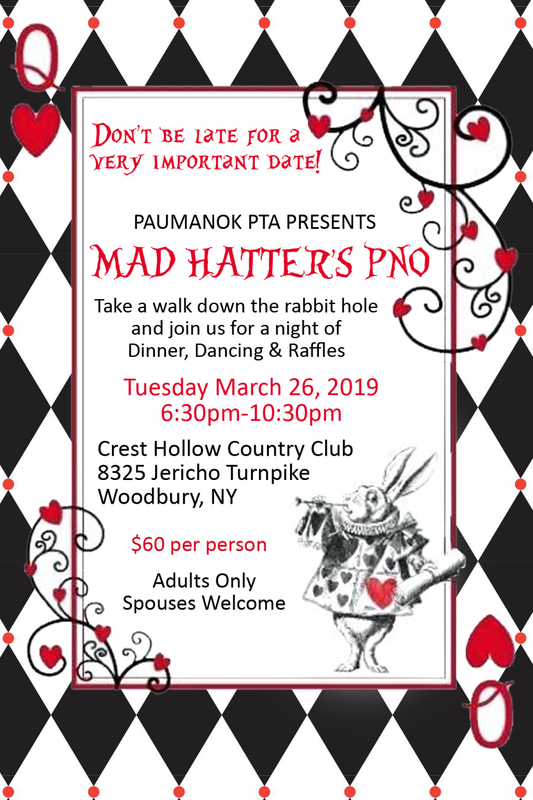 Any adult who purchases a ticket can attend PNO. Teachers, parents, grandparents and friends are all welcome, including friends from other schools. Anyone is welcome to join the PNO Committee. You can volunteer from a few minutes to everyday. We will accept any help that is offered. PNO Committee helps with requesting donations, picking up donations, wrapping raffle baskets and setting up the day of the event. If you are interested please contact Aimee Prole ([email protected]) and we can work around what ever your schedule is. Bringing in just one donation can make a huge difference! Donations in the form of cash, gift certificates, and/or merchandise is graciously accepted. We are looking for: Season tickets that you aren't using, unopened bottles of wine for our wine pull, brand new in box gifts (maybe your child recieved something that they never opened and you would like to donate it). Is there a place that you frequent often (restaurant, kid's after school activity, etc?) Business owners are more likely to donate to people they know. Use our donation request letter to ask them for a donation. If interested please fill out our business ad form. Please direct any questions reguarding PNO to Aimee Prole.